Your “Spam” folder is an e-mail folder on all e-mail accounts that quarantines e-mails that have an above-average probability of being spam, but are not clearly spam. In SpamAssassin scoring terms, these are messages that score between 5 and 10. Access webmail within the control panel. Select SquirrelMail to login to webmail using SquirrelMail. 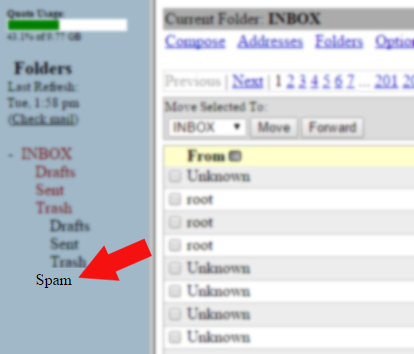 On the left-hand side, select the Spam folder. All messages scored between a 5 and 10 will be located here. IMPORTANT: Messages older than 30 days are automatically cleaned out from this folder. This entry was posted in Email and tagged spam, spamassassin, webmail.